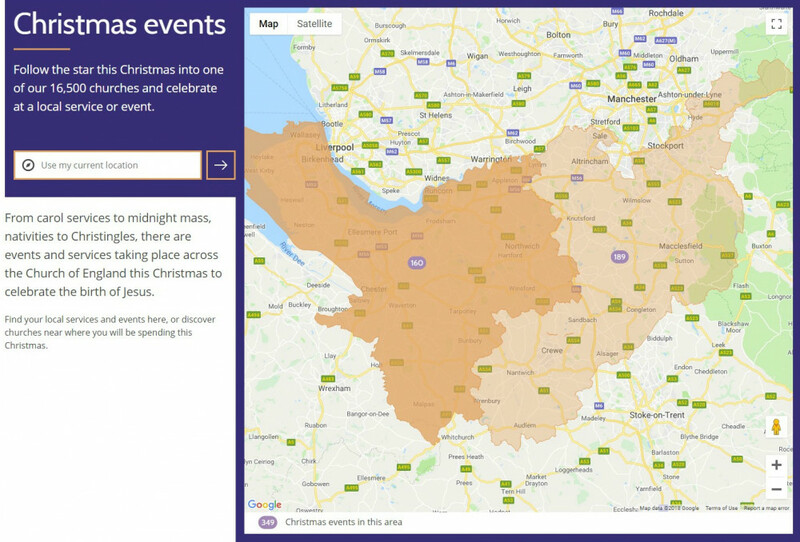 The Church of England is using geolocation technology to help thousands more people find their nearest Christmas services and events this year, as part of major new digital resources announced today. The church-finder website, AChurchNearYou.com, which already receives around 10 million page views a year, has been upgraded with a range of new features. The image below shows a clear spike in the number of page views of the church-finder website in the 48 hours before Christmas 2017. This year the Church of England expects this figure to be significantly higher still. Meanwhile, a new app will provide prayers and reflections on the go, and enhancements have been made to the Church of England’s Alexa skill. All the developments come as part of the #FollowTheStar Christmas campaign. Upgrades to AChurchNearYou.com allow smartphone users to see the exact location of their nearest Church of England church in real-time, with up-to-date details of services and other facilities and an interactive map. Users simply enter a postcode or press "find" to use their current location. The site also features a personalised #FollowTheStar homepage dedicated to Advent and Christmas services and events. Last year more than 56,000 Christmas services and events were registered on AChurchNearYou.com, and this year thousands more are expected to be listed. The image below shows the number of Christmas events listed on ACNY in the Diocese of Chester, as of 05 December. Recent figures show that the numbers attending Christmas services rose by 3.4 per cent to 2.68 million last year. Combined with figures for special services in churches during Advent, including carol services, there were nearly eight million attendances over the festive season. AChurchNearYou.com is a key resource that can help local churches grow attendance at services and events. Nearly half a million people will visit the site this year. All Church of England churches are encouraged to add their Christmas services and events as soon as they. Are you responsible for editing your ACNY page? Need some help? There is a comprehensive help page on the ACNY site for editors and administrators. Browse this help section for an answer to your question. Unfortunately, as ACNY is a centralised resource run by Church House, Westminster, the diocesan communications team is unable to help with requests to gain access to your church page. However, we may be able to assist with the editing process once you have access.